To show that it was the beetles' hot legs that made them climb the ball, the researchers applied some cool (as in temperature) silicone boots to their front legs as alternative protection from the heat. "To our great surprise, this actually worked, and beetles with boots on climbed their balls less often," said Dr Jochen Smolka from Lund University, who collaborated on the research. Once on top of a ball at midday, the beetles were often seen "wiping their faces", a preening behavior that the researchers suspect spreads regurgitated liquid onto their legs and head to cool them down further. That's something the insects never do at other times of day. The findings are yet another reminder of the many creative solutions found in nature. According to Smolka, "Evolution has an astonishing ability to make use of existing structures for new purposes – in this case using a food resource for thermoregulation." More information: Smolka et al. 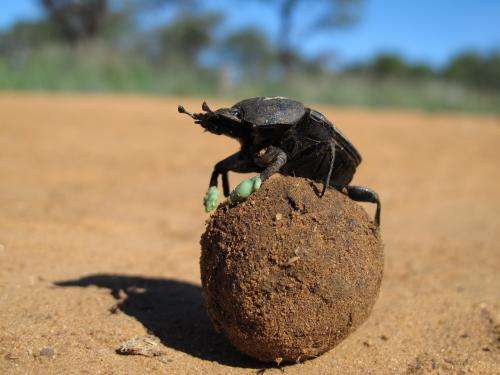 : "Dung beetles use their dung ball as a mobile thermal refuge," Current Biology. Fascinating. Republicans use their dung balls for the same purpose.